When I found this smart fabric I knew it would be on my next desk project. 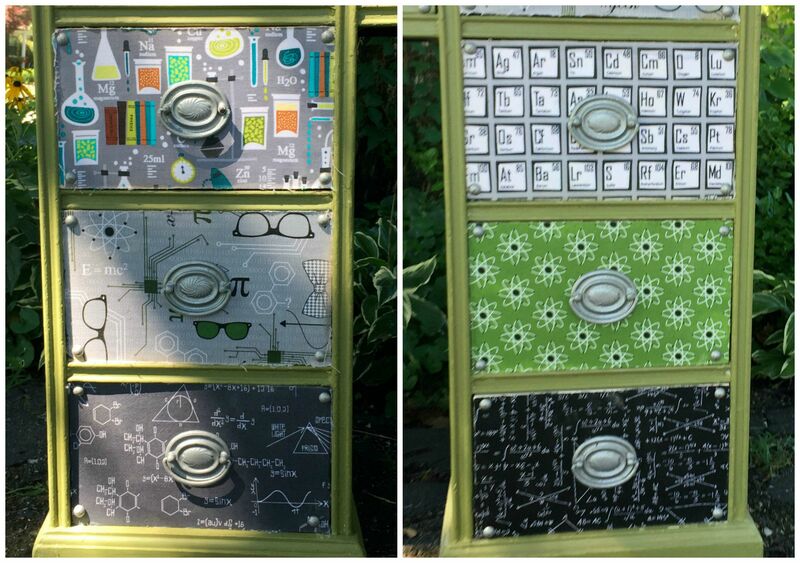 With this desk you can find algorithms, the periodic table, beakers filled with colorful liquids, eyeglasses and bow ties. 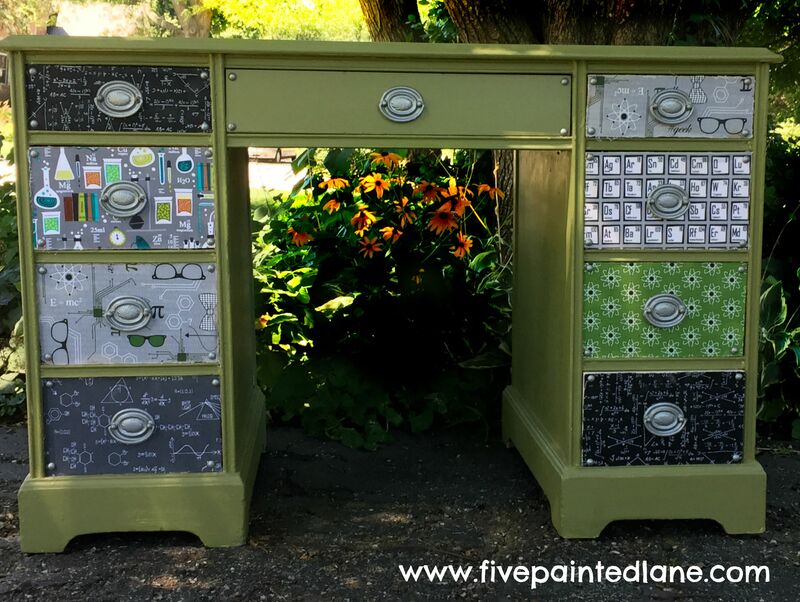 I painted an ordinary desk with a nice olive green and then out came the Mod Podge. After removing the hardware I gave the drawer fronts a good coat. I positioned the fabric onto the drawers and let it dry overnight. After I trimmed the excess fabric I gave the top another coat of Mod Podge to give it a good sealed surface. I painted the hardware silver and replaced them. For an extra bit of fun I hammered silver upholstery brads into every corner. When I finished I stepped back and kept repeating, “I do not need another desk”, ” I do not need another desk”. After photographing this desk I immediately placed it into the SUV to take to my “boothtique” space. I knew if it made it into the house it was not coming out anytime soon. This desk is so much fun! I’ve recently discovered Mod Podge and now I can’t get enough of the stuff. Can I ask a technical question – you mention trimming the fabric between coats of Mod Podge, how much excess fabric was there to trim and what technique did you use (scissors, knife)? Thanks! Hi Kimmy I am glad you recently discovered Mod Podge. A whole new world awaits you. After the material on the drawer dried I turned it upside down ( fabric side down ) on a cutting mat and I used an exacto knife. This is the tool you will need: X-acto it has a pointed blade. I am trying to insert a photo here but not working. hmmmmm you can see it in this post. In my post “floral fabric desk” you will see all of the how to’s with this technique. P.S. modpodgerocksblog.com is a blog I love if you don’t know about it already, check it out.